At our November meeting we shall have three short talks by members focused on different aspects of the business life of Lewes. The first speaker will be Michael Parrish, whose grandfather joined the Lewes ironmonger’s business of George John Wightman in 1915, after which it became Wightman and Parrish. Ironmongers were a key feature of every market town, serving the surrounding rural area as well as the town itself. The Wightman and Parrish retail shop had a central position near the War Memorial but its warehouses and workshops spread across the town, incorporating at one time the former Morris foundry in the Cliffe, later spun off as the agricultural merchants Culverwells. The business seems to have been profitable – both partners acquired substantial houses in the Wallands. The secret of success was to keep up with the times, and be prepared to diversify – leaving one area as demand ceased for more promising new areas. The business expanded into other towns, and although the Lewes shop closed some thirty years ago, the business still continues today from its base in Hailsham. It has recently celebrated its centenary, in the hands of the fourth generation of the Parrish family. Older members will remember the cash carrying systems that used to whiz around some older stores, carrying money payments to a central location, and then returning with change. Andrew Buxton will tell us about the various Lewes shops that used to use such systems. John Kay will complete the programme with a short talk about the long history of Wycherley’s, the estate agency founded by Alfred Wycherley well over a century ago. Five generations of the Wycherley family have lived and worked in Lewes. Previous editions of these Bulletins are available on the LHG website, and Barbara Merchant has set up our website so that Google searches identify relevant Bulletin articles high on the list. However, I do maintain a running index that lists our events, and the Lewes people, places and topics covered in these Bulletins. If you would like an electronic copy of the index up to Bulletin no.100 please contact me via the email address at the end of this Bulletin. Mrs Alice Dudeney records one Lewes resident’s perspective of the end of the Great War in ‘A Lewes Diary, 1916-1944’ (edited by Diana Crook). She was then living at 138 High Street, near the Old Grammar School. 11 November 1918: “Armistice signed. I was typing in the middle bedroom when Ernest [her husband] called up from the yard: ‘Alice, it is over’. He wouldn’t come out again, but I tied on Nelson’s red, white and blue bow and off we went into the High Street [Nelson was her dog]. Everything and everyone delirious. All the dogs out, all with bows, and all twisting round your legs in the crowd. A lot of soldiers outside the Town Hall collared Mackay Clarke, the Rector of All Saints, bundled him up on to an impromptu platform, roared at him to make a speech. So there he was, with his ginger moustache and his sweating carrot red face, waving his arms about and moving his lips, and nobody heard one blessed word for the shouting and laughing and roaring. And lots of people were crying and one old woman outside Stone’s shop said ‘but think of them poor boys what ‘ull never come back’ “. Celebrating the 100th of something is a familiar experience. 2018 is notable for a number of centenaries, not least of course the end of the Great War. It is also the centenary of the Representation of the People Act, 1918. Our own modest contribution to 2018 is the 100th edition of the LHG Bulletin and as such we thought it timely to record some of the LHG highlights since the Bulletin was issued. Our origins: The Lewes History Group was inaugurated in the summer of 2009 by John Kay and Paul Myles. Early meetings of the ‘core group’ were held at Paul Myles’s house. This ‘core group’ functioned as an organising and research committee. From the start the aim was to hold regular public meetings and these have always been held at the Kings Church Building. The very first public meeting was on the 2nd October 2009 and featured Helen Poole who gave a talk about ‘Medieval Lewes, Castle & Priory’. A series of weekly talks were held during the autumn of 2009 in the old King’s Church building, now demolished, but since 2010 the talks have held monthly. John Kay took on the task of preparing a monthly Bulletin, which he continues to do today. We do not have a precise publication date for the 1st Bulletin but it was issued, probably towards the end of July 2010, in time to announce the ‘next meeting’ of August 9th. The meeting featured Diana Crook talking about ‘The Ladies of Miller’s’. The Bulletin also invited members to join in a visit, the very first LHG visit, to the Newhaven Workhouse, on 14th August, organised by Paul Myles who was involved in the redevelopment of the building. At the outset the LHG was organised on an informal basis. The first ‘research meetings’, held at the house of Paul Myles, organised the meeting programme as well as reviewing some of the early research activities undertaken by various members. Regular attendees at these meetings included, amongst others, Ron Gordon, Ann Holmes, Sue Weeks, Geoff Isted, Barbara Merchant and Ian McClelland as well as John Kay and Paul Myles. The 2nd Bulletin announced the public meeting in September 2010 which included three talks summarising some of the research work already undertaken. I talked about the Maps of Lewes catalogue that I had put together which was subsequently made available on the LHG website. Sue Weeks talked about her investigations into St John Street, where she lived at the time, which showed just how much of interest can be revealed when a street is carefully explored. It was from Sue’s talk that the whole idea of the Street Stories project originated. The third talk was by Ron Gordon who told us about the windmills in and around the town. Towards the end of 2010 we also established our web site. This was set up by Barbara Merchant who continues to manage and develop our web site. Barbara also subsequently undertook the development of our social media presence via Facebook and Twitter. The Organisation matures: In February 2011 the Bulletin presented the first accounts of the Group for 2010. Ron Gordon, who has served as out treasurer from January 2010, reported that £297 had been brought forward from 2009 and our balance at the end of 2010 was £1,264. At that time the only source of income was the meeting entry fees. Meeting attendance was then generally quite modest compared with the current level. Nevertheless it was clear that the level of interest was gradually increasing and demonstrated an appetite for the type of programme we were putting together. The Bulletin also announced that I had agreed to chair the public meetings from the February meeting. During the course of 2011 and early 2012 it became clear that the Group needed to be put onto a more formal footing. In essence this meant setting up our ‘Terms of Reference’, appointing an executive committee and introducing membership subscriptions as a way of financing the group’s development. The inaugural AGM was held at the December 2012 meeting and formal membership initiated the following January. The Executive Committee comprised myself as Chair, Ron Gordon as Treasurer and John Kay as the meeting Programme coordinator as well as looking after the Bulletin. Neil Merchant took charge of Membership, Barbara Merchant looked after our Digital presence, Jane Lee coordinated our Public Relations and ensured that our meetings were well publicised throughout the town, and Ann Holmes in an ex-officio capacity. Paul Waller was co-opted in 2013 to coordinate the Outings programme but resigned in 2014. Krystyna Weinstein was co-opted in 2018 as our EC meetings secretary. Promote projects that actively engage local people. These aims still are at the core of the way we run the Group. In support of these aims the Executive Committee initiated the ‘Development Fund’ to provide support to those members who needed financial help for their projects. The first three months of 2013 were anxious times for the newly formed Executive Committee. How many people would actually join? Neil Merchant has managed and maintained our membership lists and distributed the Bulletin. By March 2013 we had 95 members which grew to 171 by the end of the year. As of October 2018 current membership is 317 with our ‘information only list’ at 315. Talks: We have had many wonderful talks over the years and the gradual increase in meeting attendees demonstrates how much local residents value them. It would be too much to itemise all the talks we have enjoyed. It is worth noting that average attendance in 2012 was 50. In 2013 this grew to 120 and last year it was 150. In the current year the average to date is 175. Jane Lee’s PR skills have been critical to this increase. The four most popular deserve mentioning. In November 2017 Bob Cairns attracted 244 attendees for his talk ‘Lewes in Living Memory’. In April 2018 220 attended Ian Everest’s talk ‘Tales from the Riverbank’. In October 2016 201 people came to the talk by Brigitte Lardinois ‘Stories seen through a glass plate’, and in June 2018 199 attended Mat Homewood’s talk about the ‘History of the Lewes Workhouse building’. Publicity: The Group has benefited greatly from the PR work by Jane Lee. Jane has ensured that the talks have been widely publicised around the town and undoubtedly contributed directly to the steady growth in membership and meeting attendance over the years. Janes’s work has also complemented the work of Barbara Merchant in maintaining our web site and extending our reach through social media. Projects: The LHG has supported several members’ projects over the years. The most significant initiative has been the Street Stories project. Following on from Sue Weeks’s investigation of St John’s Street we held a workshop at the February 2012 meeting at which we invited members to bring along some evidence that illustrated the history of the house where they lived. 30 participants worked in one of three groups that corresponded approximately with the area of the town in which their house was located. The breadth of information that was revealed and the enthusiasm that was generated in such a short time gave us the impetus to look at how we could best follow up. Over the following months the idea of the Street Stories project evolved. The main aim in the first instance was to support groups of members who wanted to investigate their own street(s). In order to support this effort we also applied to the Heritage Lottery Fund for financial support. We made two applications, the first in 2013 and the second in 2014, both of which, unfortunately, were rejected. However the experience of going through the application process convinced us that we had the makings of a great project so we decided to continue. In parallel to these efforts several groups came together at different times and started to undertake investigations. One of the earliest to report on their results was the Chapel Hill group in April 2014. Other groups that have also reported on their work to varying degrees include Abinger Place, Castle Banks, Grange Road, Keere Street, Malling Deanery, the Nevill Estate, St John Street, South Street, Sun Street and Toronto Terrace. Their reports on their work can be found on the LHG website. Of all of these groups the Sun Street group made the most notable contribution by putting together their book ‘The Sun Street Story’ in 2016, co-authored by Brian Cheesmur, Rosemary Page, Frances Stenlake and Susan Weeks. This was the first book to be published by the Group. Several groups also made significant contributions to the local Heritage Open Days. In 2015 members form the Pells area exhibited at St John-sub-Castro church, and in 2016 Grange Road and South Street had an exhibition in the Yarrow Room at the Town Hall. The Screen Stories project, celebrating the experience of going to local cinemas, also made a notable contribution to the Group. One of the results of this project was the second book to be published by the Group, ‘Screen Stories – Lewes goes to the cinema’ authored by Ruth Thompson. The project also participated in the 2017 Heritage Open Day with an exhibition at the Depot. Two other projects we have supported financially are ‘Unveiling the Edward Reeves Archive in Lewes’ and the related ‘From Suffrage to Citizenship’ project, both of which are led by LHG members. Visits: While our first visit, to the old Newhaven Union Workhouse building in 2010, was well attended, some subsequent attempts were less successful, and for some years our visit programme was suspended. However Jane Lee has recently revived this programme, organising successful and well-attended visits to Bridge Cottage, Uckfield, in 2016 and to 33 Palmeira Mansions, Hove, and the Regency Town House, Brighton, in 2018. Courses: The Group has also run several courses for the benefit of members. These have included Oral History training, Genealogy workshops, the interpretation of Wills and Deeds, and two Family History workshops. Cooperation: It would also be remiss of me not to acknowledge the excellent level of cooperation we have enjoyed over several years with other local organisations. These include Lewes Town Council, the local Heritage Open Days group, the Friends of Lewes and the Depot. There are many people to thank for their contributions to the Lewes History Group. To thank them all in name here would result in a rather long list. However given that the stimulus for this article was the 100th edition of the Bulletin it is only right that we should mention John Kay in particular for all his effort in ensuring we receive a Bulletin regularly every month, and not least for also writing many of the articles. 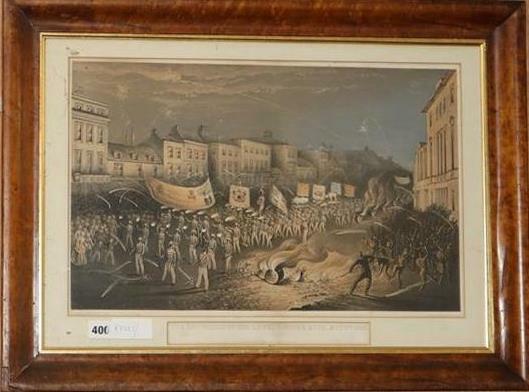 Lot 400 of the weekly auction held at Gorringe’s Auction Gallery on Monday 29 October 2018 was this framed lithograph by Lewes artist Thomas Henwood of the 1853 Procession of the Lewes Bonfire Boys. Features of the scene include effigies, banners, torches held by the marchers, fireworks, flaming tar barrels, animated spectators and a bonfire blazing outside County Hall in a High Street that appears rather wider than it does today. The lot was estimated at £80-£120. This entry was posted in Cultural History, Lewes, Local History, Military History. Bookmark the permalink.